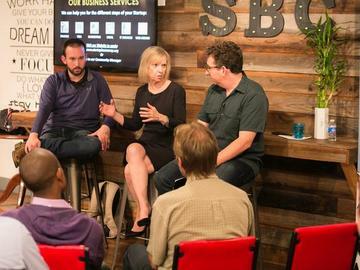 Join us for VC Chat on the questions that VCs ask Startups with Ann Winblad, Partner Hummer Winblad & Jake Chapman, Gelt Ventures. Ann Winblad, CoFounder/Managing Director Hummer Winblad Venture Partners. Hummer Winblad Venture Partners is a leading venture capital firm focused exclusively on software investing and manages over $1 billion in cumulative capital. Since Hummer Winblad Venture Partners’ inception in 1989 the firm has launched over 160 new software companies. Ann has over 30 years of experience in the software industry as a successful software entrepreneur, strategy advisor, technical author and venture capitalist. Her background and experience have been chronicled in many international business and trade publications. Ann has a B.A. in Mathematics and in Business Administration from St. Catherine University. She has an M.A. in Education with a focus in International Economics from the University of St. Thomas, St. Paul, Minnesota. Ann also has an honorary Doctorate of Law degree from the University of St. Thomas. Ann has served as a Director of numerous start-up and public companies. Ann currently serves on the Boards of Ace Metrix, MuleSoft (NYSE: MULE), OptiMine, and Sonatype. She is also a member of the Board of Trustees of the University of St. Thomas, and a Board member of the Richard Schulze Family Foundation. Ann also serves as an advisor to many entrepreneurial organizations. Jake Chapman, Founder Gelt Venture Capital. He believes that technology can be a force for good in the world and invests in companies making an impact. Jake focuses on technology companies working on the frontier of technology including robotics, autonomy, advanced manufacturing, space and artificial intelligence. Prior to Gelt VC Jake ran a Silicon Valley based corporate venture fund, founded a successful ad tech company that at its peak generated 65M targeted ad impressions a month, lead global logistics for a startup, was a venture capital attorney, dealt poker and made a damn fine cup of coffee. When not working with his companies Jake enjoys writing about the tech sector and is a contributor to TechCrunch, WIRED, Venture Beat and Pando and has been featured in global publications like US News & World Reports and Forbes. Moderator: David Spark, Tech Journalist & Founder Spark Media Solutions, a content marketing firm for the B2B technology industry. Spark has reported on the tech scene for more than 20 years in more than 40 media outlets. and he now reports predominantly at trade shows for companies such as HP, IBM, Microsoft, LinkedIn, Dice, Citrix, and Juniper Networks. Read Spark's musing on his Spark Minute blog or listen to him and his co-host weekly on the Tear Down Show podcast. Thanks to Startup Basecamp for use of their venue. Startup Basecamp is the first startup hotel in San Francisco for Startup Professionals & entrepreneurs. Their co-living & co-working spaces offer a quality short-term solution to easily land in Silicon Valley.